The five families who founded Nofei Nechemia were all new immigrants from the Former Soviet Union who had moved to Israel as teenagers. They had come to Israel at a very young age, attended high school here and hoped their families would follow them. When they didn’t, they found each other and became family to one another. While studying in Israel, they were able to rediscover their faith and reconnect to their Jewish roots by reading the Bible and absorbing Jewish history. Like Biblical Abraham, these teen-agers left their country, their people and their family home, and came to the land that was promised to Abraham by God. The community began as a dream they had each carried in their hearts, a desire to become true pioneers and build a new home in the Promised Land. 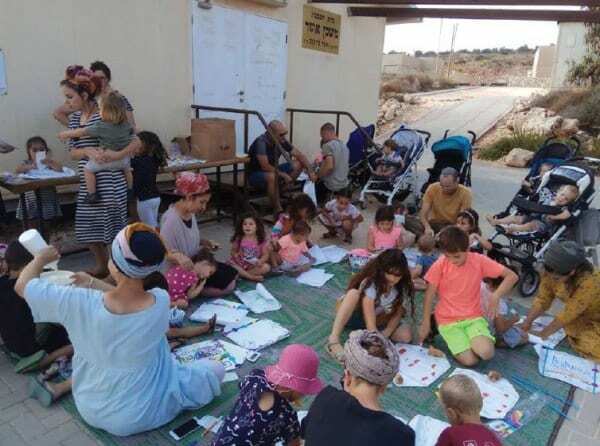 They had a vision that their group, now with families of their own, could create a new community in Samaria. With the help of the people of Rechalim, the adjacent community, this vision became a reality and Nofei Nechemia was established. At the end of the summer of 2002, five mobile homes were parked on an empty hilltop and the group moved in with their few belongings. They were young and vibrant, full of passion, and genuinely looking forward to whatever adventures would come their way. The first few months were difficult. There wasn’t a proper road or any phone lines and a water tank was delivered only once a week, their only source of fresh water. But the nights brought greater challenges. The people of Nofei Nechemia had to protect themselves from the hostile Arab population that surrounded them; they would take turns guarding the fledgling community throughout the night. It wasn’t easy — the community wasn’t gated and they felt vulnerable. There are 150 children in Nofei Nechemia, and there is a day-care center and pre-schools to accommodate the youngest of these children. Although the community has grown beyond anyone’s imagination, considering its modest beginnings, the main challenge facing the community on a daily basis is security. Members of the community are all involved in protecting their families and the volunteer rapid response team is always on call. Just under two years ago, the community faced a real scare – they were alerted that a suspicious character was approaching the homes. In less than five minutes, the community went into lock down, the Rapid Response team assembled and together they tried to locate the intruder. The lock down continued for more than an hour and the fear began slowly creeping into the hearts of the brave mothers and fathers sitting at home, watching their children and hoping it would all end well. 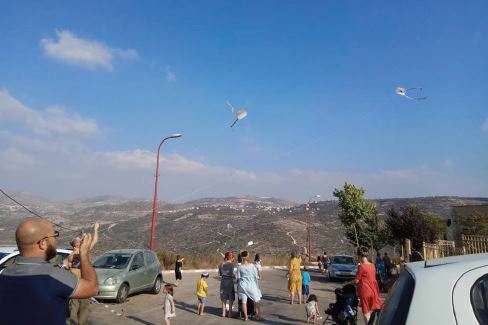 Thankfully, the suspect was located running back to the Arab village from where he had come, and the community of Nofei Nechemia could return to their lives. The lockdown continued for more than an hour and the fear began slowly creeping into the hearts of the brave mothers and fathers sitting at home, watching their children and hoping it would all end well. Facing constant threats, and based on the advice of the IDF, the community decided to install surveillance cameras, especially at vulnerable points around the community. This is where CFOIC Heartland was able to step in and make a difference. Thanks to you and to our supporters all over the world, we were able to provide Nofei Nechemia with the funds they needed to purchase the surveillance cameras. And today, the people of Nofei Nechemia feel so much safer, knowing that their families are being protected with the best possible equipment. Amichai Israeli is the head of security at Nofei Nechemia. With the enormous weight of responsibility for the entire community on his shoulders, he was the one who worried more than anyone how they would raise the funds they needed to buy the cameras. When we phoned and told him we had reached our goal and the money was on its way to him, he was overjoyed. And now that the cameras are in place, he is able to breathe a huge sigh of relief. “Thanks to the generous help from our wonderful Christian friends, the community of Nofei Nechemia can protect itself,” Amichai told me. Thanks to your help, the people of Nofei Nechemia are less vulnerable than before. And as they continue building and growing the little piece of heaven that is their community, they are moving one step closer towards the ultimate fulfilment of God’s promise of the land to Israel.